I have to admit, I used to be a snob about pudding. I love chocolate mousse, creme brulee and pots de creme, but pudding to me always sounded like the kind of dessert that you make out of a box. Like a creamy jello of sorts. 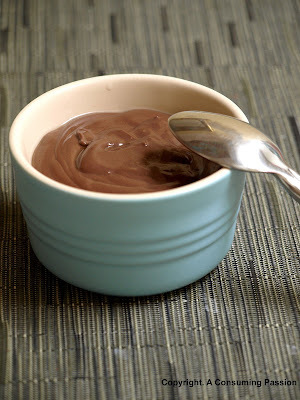 This week's TWD pick, Dorie's chocolate pudding, has made me change my mind. Homemade pudding is different from anything that you'll ever get out of any box. This pudding, although made only with milk, is as creamy as any chocolate mousse you'll ever taste. And the texture, is so incredibly smooth. I read on the TWD comments section about this recipe that one of the TWD member's son said that if you could put a dress on pudding and marry it, he would. That just made me laugh, not because its an exaggeration, but because that's how I feel too. Although in my case, it would have to wear a suit. Try it and see for yourself. It is a world apart from Jello pudding. Incredible pudding, isn't it? You could serve it in place of mousse and no one would be the wiser. So true about the snob thing for me as well - this trumps some of the sub-par mousses I've had though, that's for sure. I had the exact thoughts.. but then again, no store bought pudding tastes this good! It's definitely not like the instant pudding of my childhood. Amazing picture, by the way! I felt the same way. Lovely pudding! You always have the best pictures, I enjoy seeing them every week! Homemade pudding is absolutely a different animal that the boxed version. I may never go back to boxed! Super creamy and delicious looking! Great photo - I love that little blue cup! Glad you liked it too! I have those same placemats! Never from a box! This is the best pudding! I love your ramekins! This recipe seems to be quite the converter. I'm late this week, but I'm looking forward to trying it and comparing it to the jello of my youth. i totally agree that this was an amazing pudding and it used milk, so awesome!! so it wasn't THAT bad plus it had PROTEIN! fab picture...! Great work. It's good to experience the real thing after having bad feelings about the stuff isn't it? Gorgeous photo. I felt the same way about my pudding--definitely not Jello. oh, it looks so creamy and divine. Great pics! yum! It looks delicious! Great job! Great picture! I'm thinking that mine would have been better with whole milk! I agree, there is nothing better than home made puddings. The reviews seem to be out - this recipe has a 5 out of 5 rating so I can I not try it? Thank goodness for Dorie, just think of all the people who think that Jello invented pudding and don't even realize that you can make it from scratch! I love the pudding in a blue ramekin. Gorgeous color choice. I love chocolate, so this is just the thing for me, beautiful!